We work with Adobe Illustrator on Wacom pen tablets and provide files in the format you require. Delivery is by email attachment or on CD through the post. The most commonly used format is EPS. Other formats are possible. We create our illustrations in a way that enables you to change colours or plot out shapes easily. Shapes can be modified and parts erased or added, according to your individual requirements. 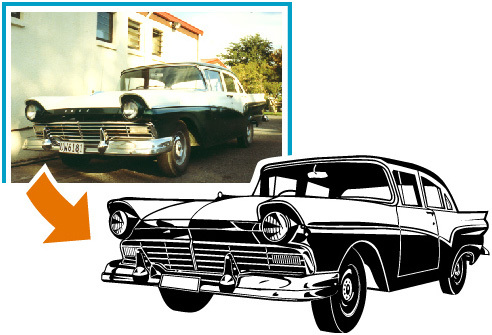 Additional range of service: Photo composing, photo touch up, creating exact clipping paths around objects, providing shadows and backgrounds, converting picture files and turning photographs into line drawings, as the example below shows.